clueless about how to eat healthier in fast food, fast casual? perplexed by Thai, Mexican, Italian and other ethnic menus? challenged by huge portions served by restaurant foods? unclear about how to put healthier restaurant meals together? Eat Out, Eat Well – The Guide to Eating Healthy at Any Restaurant - 2016 Silver Medal Winner of the IBPA Benjamin Franklin Award - is your go-to resource to assemble healthier meals in any restaurant, from fast food to fast casual, upscale dining and myriad ethnic cuisines. Keep this invaluable restaurant companion by your side! Restaurant meals are notoriously huge and loaded with fat, sugars and sodium. Get realistic advice and practical guidance from Hope, who’s been writing about this topic for 25 years. Eat Out, Eat Well has three sections. Section one delves into healthy restaurant eating with diabetes then details the pitfalls of restaurant eating with skills and strategies to combat them all. Section two covers American fare. Section three covers ethnic fare. Each shows how to eat that cuisine healthier with sample healthier meals. 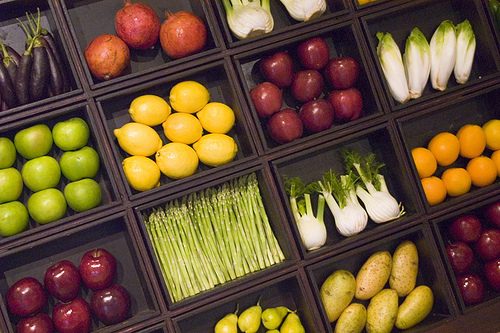 Nutrition Snapshots reveal the best and worst menu options. "Eat Out, Eat Well is an in-depth guide to enjoying healthy meals at restaurants - no, that doesn't necessarily have to be a contradiction in terms! Chapters include tips and strategies for gluten-free restaurant dining, portion control suggestions, suggestions to help children eat healthier food, information about the best and worst menu options at different types of restaurants, and much more. Advice specific to different regional cuisines (such as the menus of Japanese restaurants, or Middle Eastern restaurants) makes Eat Out, Eat Well especially valuable for health-conscious gourmets! 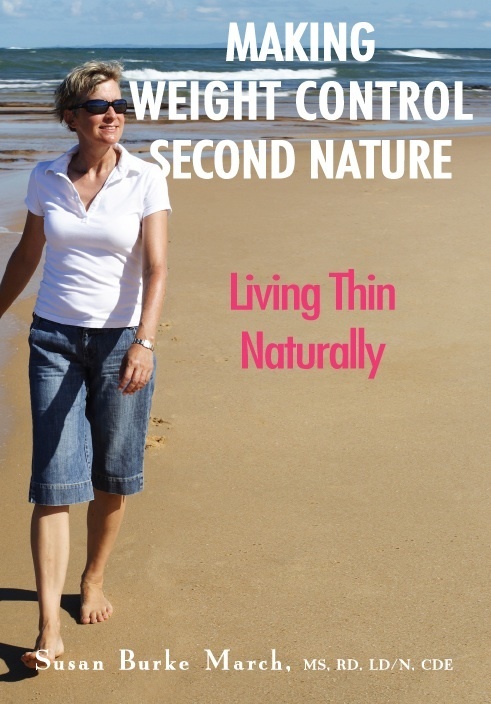 Highly recommended for both personal and public library health and nutrition shelves." 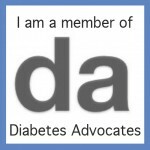 "Hope has written an easy to read, comprehensive book on eating out with diabetes. 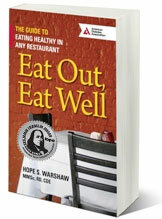 As an RD…this is a valuable resource…The book is well organized, and Hope gives easy, practical tips for choosing healthy…and delicious foods for many types of restaurants..."
"Hope Warshaw shows you how to eat out guilt-free…"
"Eat Out, Eat Right is the next-best thing to dining with a nutritionist." "Eat Out, Eat Right is loaded with strategies and tips to healthfully guide you through nearly every popular dining option from Middle Eastern and Indian restaurants to fast food and fine dining, with special sections on beverages." On 4/6/11Quantia, the creators of QuantiaMD®, the leading online physician community, announced the release of the innovative mobile application for diabetes meal planning named EatSmart over the business wire. The well known Chicago-based Guyatitian Guru, David Grotto, RD interviews Hope Warshaw about the current understanding of the progression of prediabetes and type 2. Warshaw outlines key action items to take control of prediabetes or type 2 from day one of diagnosis. Don't delay, don't deny are two of Warshaw's messages. Yes, we’re once again in depths of the post holiday New Year's resolution ritural. And yes, the most common resolution is: lose those unwanted pounds – again or still. But, think - are you really ready to lose weight and do the daily work to keep off those unwanted pounds? 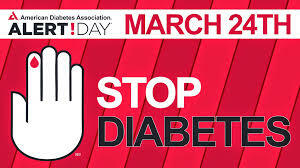 The first report of the Diabetes Prevention Program Outcome Study (DPPOS) came out October 29th, 2009 online in The Lancet, a well known medical journal. DPPOS is part two of the ongoing Diabetes Prevention Program (DPP) conducted in the U.S. as a National Institutes of Health multi-site study. The DPP and DPPOS results are similar to findings from trials conducted internationally over the past two decades in Finland, China and elsewhere.